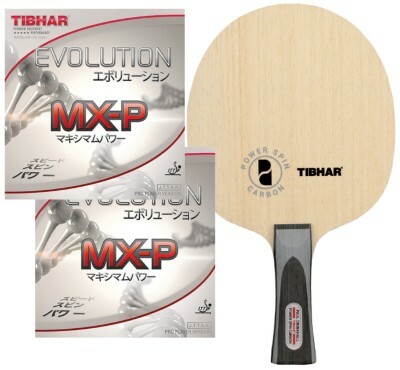 When you start to progress from intermediate level to advanced level, you should consider upgrading your table tennis bat. For most players, this means buying a bat with a faster blade and faster rubbers to help generate more speed and spin. Your shots will have more zip, more penetration and more power. Of course, a faster, spinnier bat is usually more sensitive to the other player’s spin, but if your table tennis skills are becoming more advanced, you should be able to cope with this. In this article I share some advice and recommendations about which bat to buy when you start reaching an advanced level of play. Most experienced table tennis players (who play at an advanced level) will have a custom set up. This is where you choose a blade, rubber for your backhand and rubber for your forehand. Every rubber and blade is slightly different, so you can really tailor your table tennis bat to compliment your playing style. Most players I know have been through a long process of trial and error to find a combination of rubber and blade they really like. Myself, I have spent silly amounts of money trying different equipment, but now play with a Joola Fever blade, Joola Rhyzer 48 on my forehand and Joola Rhyzer 43 on my backhand. There is a huge amount of choice available. Too much choice really. And many players who are progressing from intermediate to an advanced level can find this quite overwhelming at first. To keep things really simply, here’s some three really good rubbers and blades you could consider…. For more a more comprehensive guide and more recommendations, take a look at my article ‘Best table tennis rubbers and blades for advanced players‘. A custom set-up isn’t the only option. If this is your first venture into advanced equipment, you could simply buy a ready-made advanced bat. This is where a table tennis company has done all the hard work for you and selected a rubber and blade combination which work very well together. There is a lot less choice available (not necessarily a bad thing! ), but the few choices which do exist are usually high quality and tried and tested. You know you’re going to get a really decent table tennis bat. You should be able to get one year’s play from an advanced bat (if you play 2-4 hours per week). When the rubbers need replacing, you can keep the blade, which is usually very good quality, and then buy the same rubbers again or experiment with something different. The other benefit of a ready-made advanced bat is that they are usually cheaper than buying all the components seperately. Sometimes you can get a really decent discount. In terms of cost, you’ll probably need to spend around £90-£150 for a really good advanced table tennis bat (ready-made). A custom-made table tennis bat can cost anywhere from £90 to £300+. This is surprising for some people (“how can a table tennis bat cost so much?”), but you really will notice the difference in how much spin you can generate and how much faster you can play with high quality rubbers and blades. When you buy your first advanced table tennis bat, it doesn’t really matter if you choose a custom-made bat or a ready-made bat. Either option is fine. If you have specific requirements (i.e. you want a fast rubber for your forehand and a pimples rubber for your backhand), then you will almost certainly need to get a custom-made bat. But if you play in a similar way on both forehand and backhand, then a ready-made advanced bat may be the simplest option to start with. This will most likely be the beginning of a long journey to find your ideal rubber and blade combination for your game. But you have to start somewhere! The recommendations above will allow you play with more speed and more spin and you may get lucky and discover the perfect blade and rubbers for your game at the first attempt! Hi tom i’ve been watching your videos in YouTube and it is really big help and knowledgable. I have one problem at the moment and i think you can help me. I have DHS LONG 5 bat that i’ve been using for 2yrs now & my set up os FH 1.9 sanwei target national BH 1.9 mx-s. But a week ago i was given a TIMO zlc and set it up for FH 2.15mm 40sponge DHS NEO3 & FH 2.1mm SANWEI TARGET NATIONAL. I knew it would change the throw of the ball much faster to my usual game. Is there any advice you could give me what drills i can recover quickly to get use to my new blade and set up? Or do i have to go back on my old blade and set up? Local league is nearly finishing & english grand prix is not long now plus i have 2 championships games to play next month. I’m quite not happy as i have been practising with my team mates and see the fall of my game. ? please give me an advice. Thank you. Hi Ian … I think it’s quite tough to radically change your equipment mid-season. It may take a long time to get used to your new faster equipment. But maybe there is no need to change? If you play well with your old bat, go back to using it. I have made a number of changes over the years, which simply haven’t worked. Instead of persevering with a set up I’m not happy with (and changing my technique / playing style), I went back to what I was using before. Sometimes you just know that a new blade / rubber isn’t right for your game.